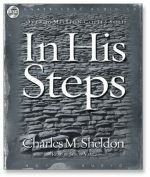 This month’s free audiobook from Christian Audio is Charles Sheldon’s In His Steps. After this month the link on this post will change to a new audiobook so be quick if you want this one. Charles Sheldon (1857-1946) was an American minister who is best known for his work with the Social Gospel movement. In His Steps is a novel, and is more focused on the moral choices we make, rather than personal salvation. The real challenge of the question, “What would Jesus do?” is not the initial fervor it evokes but the sustained devotion it can produce. You can also get a free text and mp3 of In His Stpes at Christian Classics Ethereal Library.